Many people tend to forget that the Gameboy Advance is a 32-bit system, but you can't blame them. Most developers, including Nintendo themselves, did not use the hardware to its full potential. The majority of GBA games were very pixelated and used sprites rather than 3D models, but the PS1 was 32-bit and that had 3D games, so the GBA should have 3D games as well, right? Well, it's not quite as simple as the amount of bits a system has, but it is significant, because the GBA indeed did have some 3D games as well as some gorgeous 2D games. Unfortunately most of these games were not very good, thus they are not often remembered today. Here are a few GBA games that really are incredible feats for the hardware. This 3D platformer uses full 3D models for all the characters, while relying on sprites for scenery such as trees. What is really impressive here is not just the 3D models, but also the detailed textures. The game itself is in the vein of Crash Bandicoot, but the graphics easily look like they could be on a PS1. Another game that uses 3D models, Need for Speed Underground does a great job of smoothing out the edges of the cars in the game while providing fast-paced gameplay at a steady framerate. The lighting is impressive as well, but the cars are what really shine. Doom, the Crysis of its day. This game was ported to everything, but it did not run well on everything. 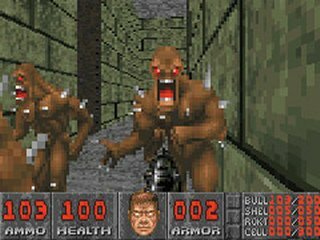 However, Doom on the GBA runs very smoothly and the character models are very detailed and clear, as seen in the screenshot. It was also a full-fledged FPS on a handheld, rarely heard of at the time. There are plenty more examples of great looking games on the GBA that pushed the hardware to its limits, but the three shown above are the probably the most impressive. 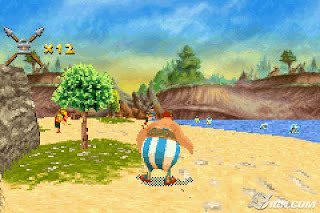 Yes, the GBA was capable of producing graphics similar to the PS1. It's worth checking out Iridion 3D as well. Perhaps a simpler trick than those shown above, but very effective and impressive for early in the systems lifespan. Continuing from above, Ecks vs Sever 1 & 2 are decent looking FPS that are comparable with Doom aswell. I never really considered any of them to be that impressive. From what I've seen it looks like Star X was pretty much the Star Fox 64 of the GBA. Kind of surprised you left out some of the big fish on this list. Wing Commander Prophecy is a full 3D conversion of the multi CD PC game that only lacks all the FMV sequences replacing them with little head pics and text. Much of the in flight verbal chatter still even exists. 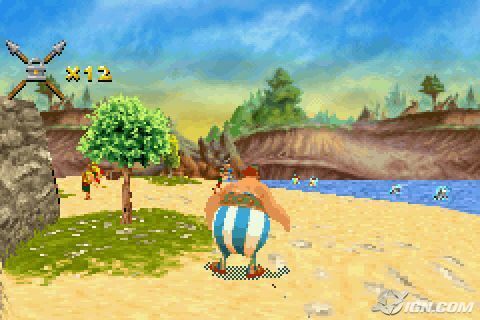 Also those the V3D engine which Asterix came from the first release was V-Rally 3 which looks/plays much like Sega Saturn's Sega Rally and it's fantastic.